Looking for a bus in Winnetka? Chicago Charter Bus Company has access to hundreds of buses to take you to your favorite Winnetka destinations or into Chicago for a day in the city. Winnetka, just outside Chicago’s urban center, is one of those places that welcomes you with open arms.The quaint area is a dream to call home, touting many perks. You can shop around in the business district, or you can enjoy Lake Michigan. And for those truly special occasions, you can head into Chicago. Chicago is a popular destination for many things—posh weddings, industry-leading conventions, and plenty of professional sports matches—so it makes sense that you might need to book a large vehicle to transport a group of people into the city for these occasions. The better question might be: Who don’t we work with? 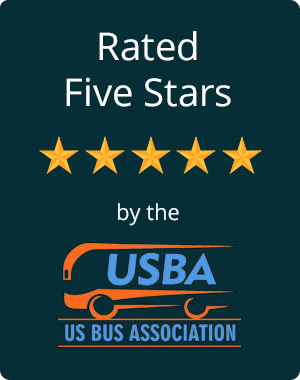 Whether for your professional or personal life, we are happy to rent out motor coaches and shuttles to clients with a variety of needs for reliable group transportation. That means our clients have previously included brides, school officials, high school sports officers, event planners, administrative assistants, churches, and spouses. As you can see, we serve a wide variety of people—this is thanks to the many bus sizes available. We love finding the best group transportation solution for groups of all sizes—sometimes, it’s a tricked-out party shuttle to Soldier Field for a birthday celebration, and sometimes, it’s a large motor coach with reclining seats for a cross-country trip to cheerleading nationals. Each coach can be customized with experience-enhancing features such as premium seats, extra legroom, and even TV monitors. All of the amenities available make every ride different, because every customer is different. Other examples of services we offer to Winnetka residents are airport shuttles and wedding festivity shuttles. Your shuttle can range from three different sizes (depending on your cargo)—these compact vehicles make airport pick-ups and drop-offs a cinch for corporate clients. And brides love booking these stylish shuttles for wedding day guest transportation and bachelorette party fun in Chicago. If your travel needs extend outside of Chicago and Winnetka, we've got you covered. Chicago Charter Bus Company also services neighborhoods such as Skokie, Rosemont, Evanston, Elgin, and other nearby areas, meaning we can always transport your group around the Chicago area with ease. What are you waiting for? Our booking process is simple. All you have to do is call us at 312-667-0906​, fill us in on what you’re looking for, and we’ll do the rest. You will receive a quote within minutes, and you can either book immediately or wait a bit to make your decision. We won’t pressure you.